The All Terrain vehicle or the ATV was designed to handle a wider variety of terrain than other vehicles. 4LowParts has all the ATV Parts and Accessories you need for your ATV such as Bumpers, Winches and accessories and Brakes. The Phantom Sun 40″ 588w LED Light Bar is are the brightest light bar on the planet, get ready for people to think you can make the sun rise. The 6 Inch LED Light Bar with Flood Beam Pattern shown here is 18 watts of LED Power. 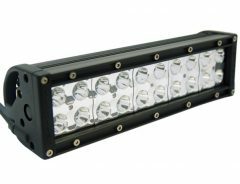 These Light Bars are very popular with ATV use and other off road light use. The Black Safety Thimble I is a smaller version of the Safety Thimble II. The STI is perfect for winches of 4,000 lbs. or smaller. They are designed to be used with a 1/2″ bow or D-ring shackle or TRE ATV/UTV Soft Shackles. Blue ATV/UTV Winch Rope/Safety Thimble I Package – 1/4″ x 50ft. If your looking to replace your steel winch cable or worn out synthetic rope, then this is the package for you. The Blue Safety Thimble I is a smaller version of the Safety Thimble II. The STI is perfect for winches 4,000 lbs. or smaller. They are designed to be used with a 1/2″ bow or D-ring shackles or TRE ATV/UTV Soft Shackles. The Bright Dipped Safety Thimble I is a smaller version of the Safety Thimble II. The STI is perfect for winches 4,000 lbs. or smaller. They are designed to be used with a 1/2″ bow or D-ring shackles or TRE ATV/UTV Soft Shackles. Green ATV/UTV Winch Rope with Black Safety Thimble with a certified breaking strength of 7,900 lbs – Perfect for the smaller off road vehicles such as ATV or side by sides. Pre-Installed with a Safety Thimble 1.